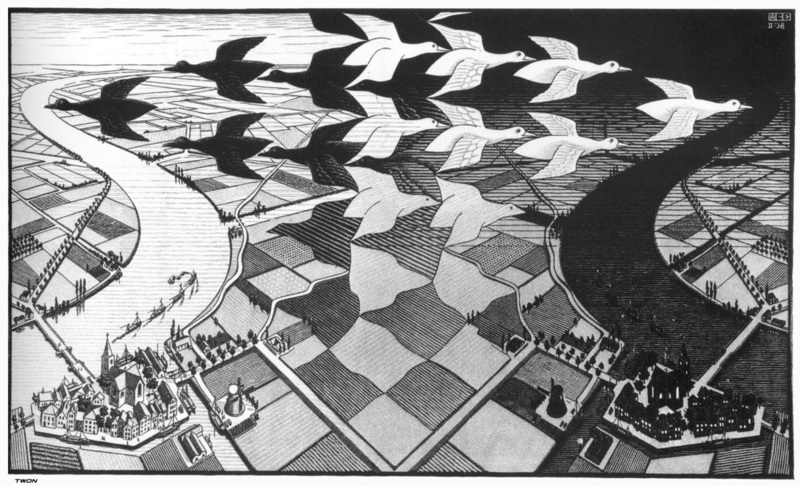 M. C. Escher was a Dutch graphic design artist. He created illustrations for books, designed tapestries, and made murals, but his main artform was printmaking. Escher’s art shows his strong interest in math and geometry. 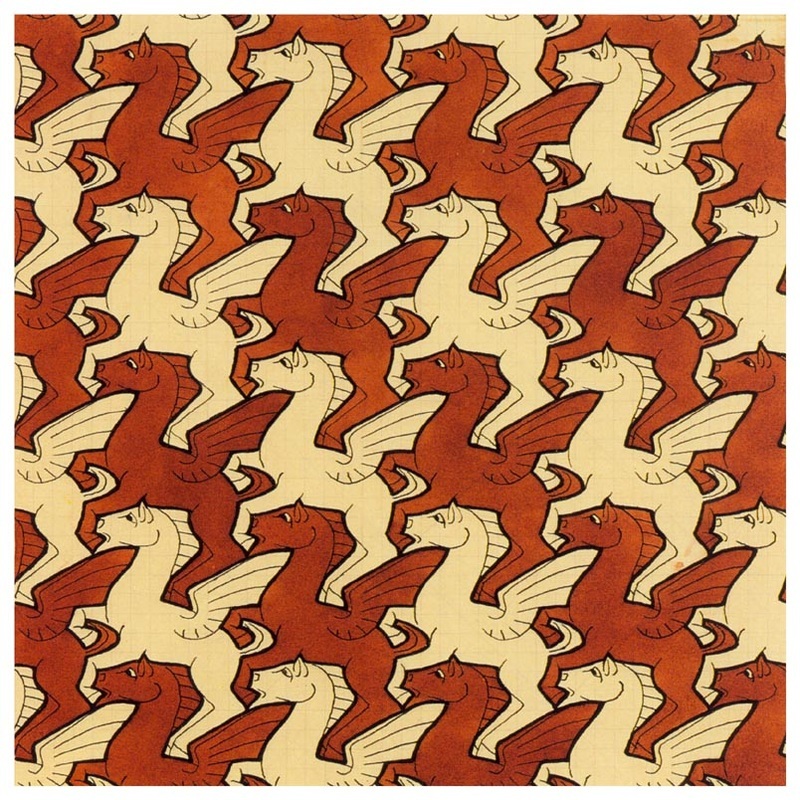 Many of Escher’s illustrations are called tessellations, which he called Regular Divisions of the Plane. 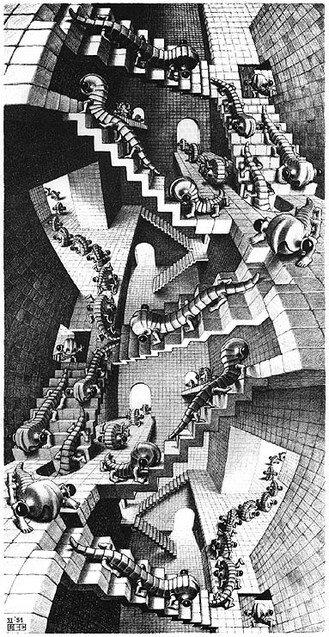 Escher's art became popular among scientists and mathematicians and in popular culture. Our artwork of the week is Escher’s Day and Night. In most artwork, the subject or focus of a picture is called the positive space, while the areas surrounding the main subject are known as the negative spaces. Artists make use of positive and negative space as part of the design of their art. In this illustration the tree ​​and ground are the positive shapes (the main focus) and the white background that fills the rest of the picture is the negative shape. 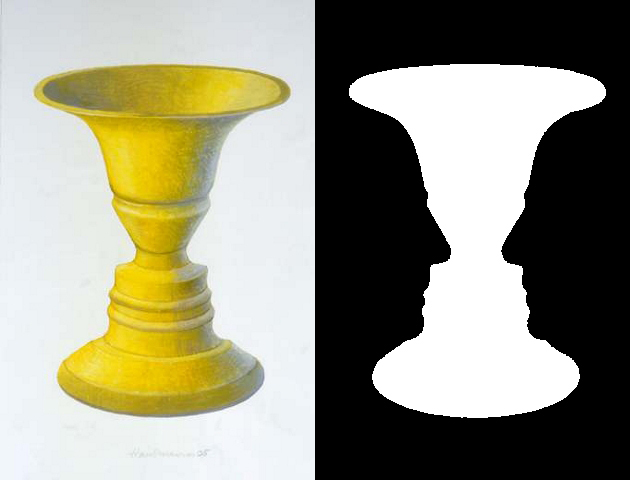 In the first picture, the yellow vase is the positive space, since it is the main focus. The light area surrounding the vase is the negative space. In the second picture, the area which appears as positive or negative depends on where you focus. If you focus on the white, you see a vase as the positive space and the black surrounding it as the negative. If you concentrate on the black, you will see two faces as the positive space (the main focus), and the white space becomes the negative space in-between or surrounding the faces. 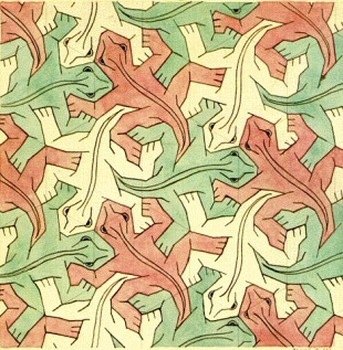 Escher liked to play with positive and negative shapes. The bird at the top appears as positive space (a main subject, yet its shape is echoed in the dark negative shapes between the fish. Likewise, the positive shape of the fish at the bottom has its shape repeated in the white spaces between the birds. Day and Night depicts a day landscape merging into a night scene. White and black birds blend, appear, and disappear. Which bird our eye notices depends on which landscape we focus on. If we concentrate on the day landscape, the black birds appear -- they become the positive shapes and the daylit land becomes the negative space. If we stare at the dark landscape, the white birds stand out, making them into the positive shapes in our view, with the darkened land being the negative space. 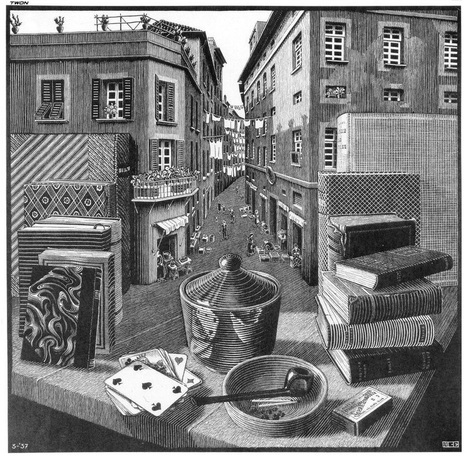 Many of Escher's artworks play with optical illusions. Positive shapes or space are the focal points of a picture or what the viewer focuses on. Negative shapes or space are the areas surrounding the part of the picture that the viewer sees or focuses on. 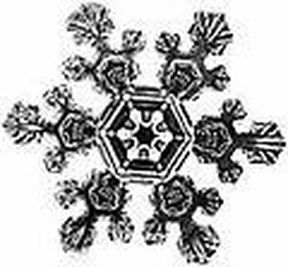 In the snowflake on the left, the white area the positive shape. The black area is the negative shape or background area. 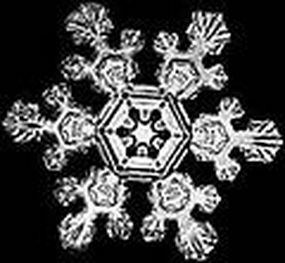 In the snowflake on the right, the black part of the picture is the positive space. It's the positive shape because that is the image the viewer focuses on. The white area is the negative space or background area. 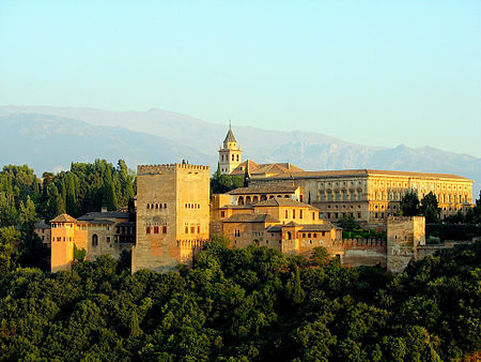 This palace was built by Muslim rulers who once controlled southern Spain. 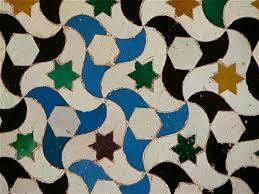 The intricate patterns of the colored tiles throughout this World Heritage site fascinated Escher and spurred his interest in tessellations. 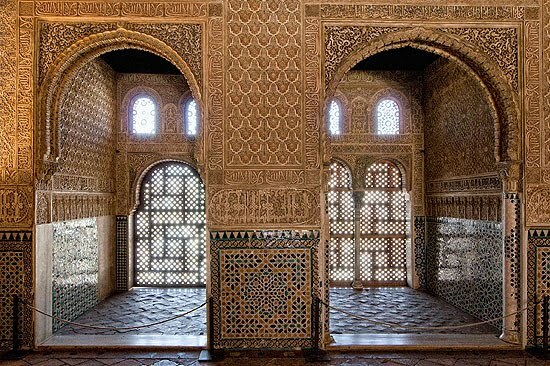 He made many sketches of the Alhambra mosaics. 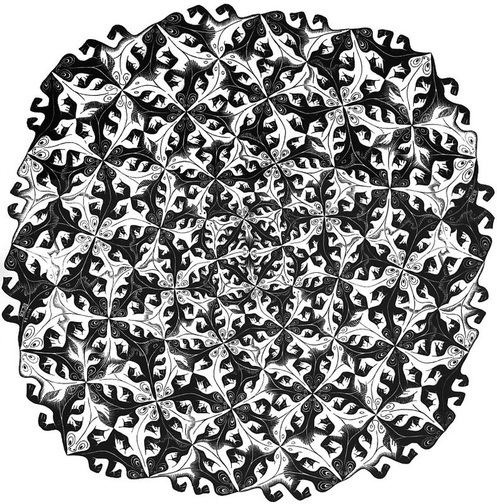 Escher’s Metamorphis prints are considered some of his masterpieces. These prints use tessellation patterns and also play with positive and negative shapes. Metamorphis I begins with an image of an Italian town on the Amalfi Coast. The architecture of the town “morphs” or changes into a pattern of three-dimensional blocks. 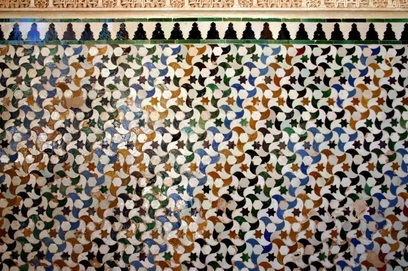 The blocks morph into a tessellation pattern of cartoonish figures in Oriental costume. Metamorphis II begins with the Dutch form of the word, metamorphosis in a black rectangle amongst a grid. The grid changes into a checkered pattern, then into a tessellation of reptiles, a honeycomb, insects, fish, birds, and a pattern of three-dimensional blocks with red tops. These blocks morph into an Italian coastal town which links by a bridge to a tower in water. This tower is actually a rook piece from a chess set. 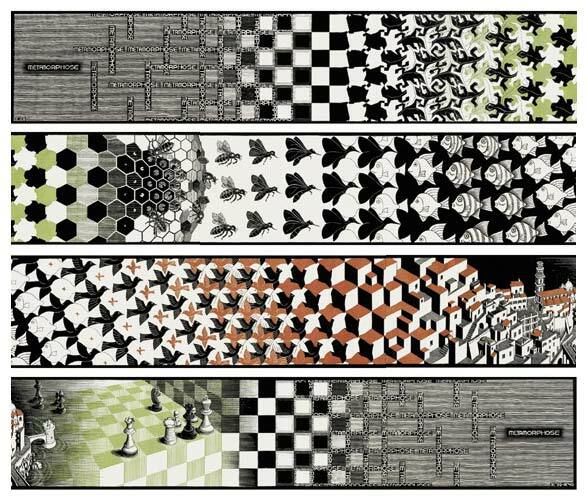 The water becomes a chess board, which leads to a checkered wall, and lastly back into the word metamorphose. 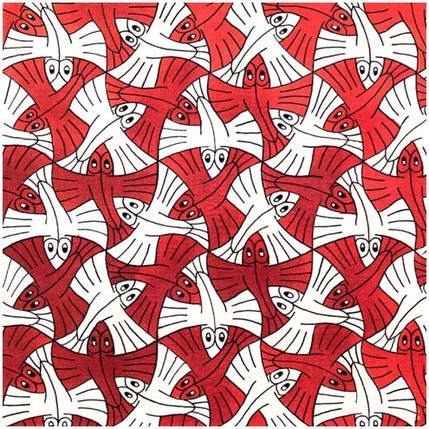 Escher completed many tessellation art works. Many of M.C. 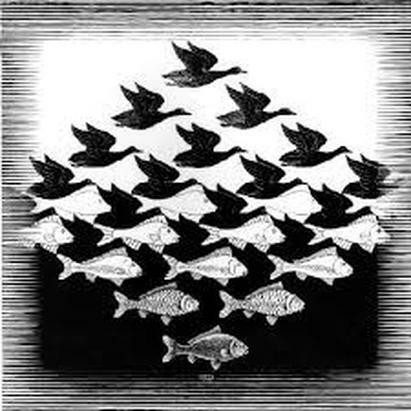 Escher’s artworks make use of optical illusions. Optical illusions deceive our eyes by making something appear other than it is or could be. Escher turned sketches of Italian landscapes into scenes with impossible perspectives that look very realistic. This print shows an impossible but real-looking combination of a still life and street scene. 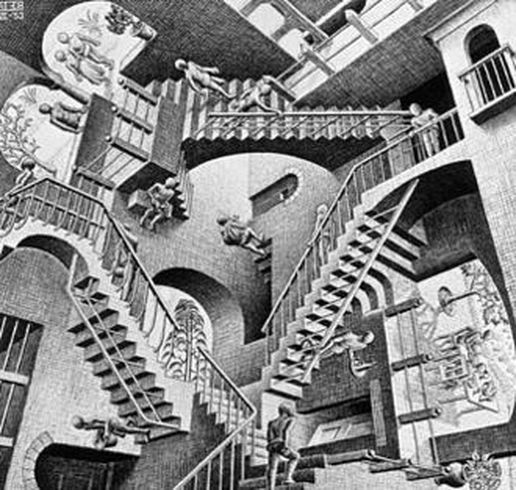 Other prints by Escher show stairs that never end or that lead in impossible directions. Gravity doesn’t seem to matter on these stairways. 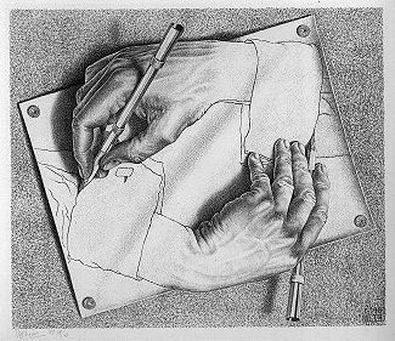 Escher’s print, Drawing Hands, shows two hands which each seem to be drawing the other. The picture contrasts the two-dimensional flatness of a sheet of paper with the illusion of three-dimensional hands. Art Docents,. "Positive & Negative Space ". N. p., 2013. Web. 15 Jan. 2016. Fussell, Matt. "What Is Positive And Negative Space". Thevirtualinstructor.com. N. p., 2016. Web. 19 Jan. 2016. 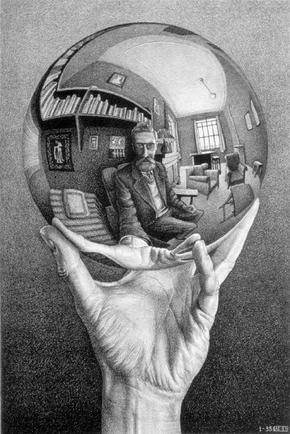 Mcescher.com,. "M.C. 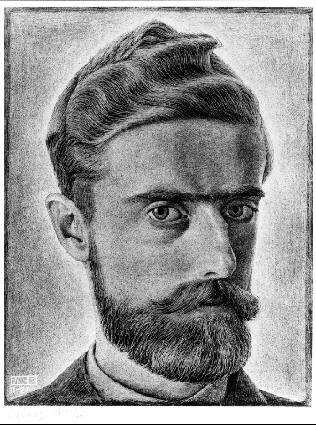 Escher – Biography". N. p., 2016. Web. 15 Jan. 2016. Wikipedia,. 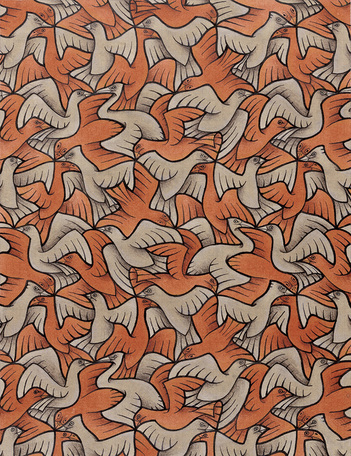 "M. C. Escher". N. p., 2016. Web. 15 Jan. 2016. Wikipedia,. "Metamorphosis I". N. p., 2016. Web. 19 Jan. 2016. Wikipedia,. "Metamorphosis II". N. p., 2016. Web. 19 Jan. 2016.